Due to irreconcilable differences between the editorial staff of Chtodelat News and the Chto Delat work group, this blog is closed until further notice. Archival materials from the past five years will still be available here, but no new postings will be made from today. This exhibition highlights the unique photographic, video, and musical innovations that shaped the Leningrad (now known as St. Petersburg) unofficial art culture during the period of glasnost and perestroika. It presents for the first time photographers, musicians, and video artists as active members of groups, rather than individual producers, to underscore their collective goals as part of a larger counter-cultural phenomenon in the city. The eclectic body of material produced over the span of a transformative decade shared a common goal: to stimulate the audience’s imagination in such a way as to disrupt everyday social interaction. Photography and video were considered unique media, able to cross the boundary between the present and the past, and thus became an important tool for fostering a reflective process. Their documentary character was exploited to reveal the city to its inhabitants, connecting individuals to the rapid transformations of Soviet society, while opening an anticipatory window into the future. Works by 20 artists are featured, the majority of which have never been exhibited before. The exhibition is supported by the Avenir Foundation Endowment Fund. This event explores strategies of political narration in contemporary photography and film. Discussion will focus on the practices of Dmitry Vilensky and his collective Chto Delat?/What Is To Be Done? Operating at the intersection of political theory, art, and activism, the artists’ work deftly combines photography, film, and audio commentary. Its goal is to bring back into memory events of the past that hold emancipatory potential for the present. Vilensky will facilitate a discussion of his practices, which are featured in the exhibition Leningrad’s Perestroika: Crosscurrents in Photography, Video and Music, on view at the Jane Voorhees Zimmerli Art Museum from April 20 to September 13, 2013. Organized by Corina Apostol, this event is co-sponsored by the Zimmerli Art Museum and the Developing Room. Philosopher Georg Lukács once said that orthodox Marxists should not believe in this or that thesis, nor in the exegesis of a sacred book. On the contrary, orthodoxy refers exclusively to method. By method, Lukács meant dialectics as a means of analyzing and representing the whole of society as a totality of struggling contradictions. All graduates of socialist schools and universities will remember this negation of negation as the third principle of dialectics, culled from Friedrich Engels’ Dialectics of Nature. What could this principle mean in art today? Confronted with a simple dumbly positive postulate of an artwork, the viewer reacts with a very basic question: why should I care? It looks like the artists are trying to brainwash me but for what reason? I won’t believe it, I’m not that simple; the characters are so conditional, it must be a Brechtian device. Why are they constructed in such a way? And why do they still give me aesthetic pleasure? Perhaps there is something beyond this simplicity? It is with such questions that the negation of negation begins. Chto Delat have embarked on a quest for a currently attractive, emancipatory potential of leftist ideas. Chto Delat strongly criticize the reality of contemporary political and social life in Russia, art institutions, and Western capitalism. Chto Delat flourish in the international institutional art market, operating in the convenient framework of the capitalist system. Chto Delat embody the dream of engaged Russian art in the Putin era, dreamed of by curators from the West. At the same time they rarely show up in the official salons in Russia. Each of the above statements is true: this is a conclusion one can draw upon a close inspection of the exhibition in Wroclaw, reading the numerous descriptions, theoretical and polemical texts, or studying the performances and documentation of actions published on the collective’s website. To Negate Negation is a unique exhibition, as it is the first presentation of contemporary Russian art in the Wrocław gallery Awangarda after the fall of the Berlin Wall and the collapse of the Soviet Union. It is also the first exhibition of the group Chto Delat in Poland, presenting the whole panorama of its activity. As part of the show, we will find all themes characteristic of the artistic practice of Chto Delat, including, in particular, references to the Hegelian and Marxist dialectical struggle of opposites, inevitably driving social change. The title To Negate Negation already contains direct references to the terminology originally borrowed from the idealist dialectic of classical German philosophy, and specifically to one of the three universal laws formulated by Hegel’s dialectic – negation of the negation. In turn, individual projects of the collective shown in the exhibition relate to the dialectical principle of testing the reality which involves the disclosure of its existing contradictions, the study of the clash of these contradictions and the resulting changes, that is, in short, to the principle underlying the methodology of Marxism. At the core of the exhibition lie projects commenting on the current situation, social and political events in various countries (Russia, Serbia, the Netherlands), petrified by allegorical methods and visualized primarily in film productions, the so-called Songspiels. The actors embody various sections of the society, represent various (age, professional, political) groups and their aspirations, interests and visions, as well as the existing opposition between them, building tension and conflict. Both these projects and other documentary and para-documentary recordings reveal interest in “classic” leftist work – the epic theatre of Brecht and Godard’s New Wave cinema. Apart from film showings, the arsenal of devices employed by Chto Delat consists of a few simple methods. Institutional space, annexed by the group in various parts of the world, is usually organized in a similar manner – by means of simple elements of stage design, reminiscent of home-made banners or mock-ups, as well as prints, murals, flags, posters and publications. These elements are often accompanied by on-site actions, meetings and discussions. Each of these devices is invariably associated with the language of propaganda and agitation, a message addressed to the widest possible audience. In each case, an institution turns into such a propaganda mouthpiece, becoming at the same time the (knowing) object of the collective’s genuine contempt. Yet the collective declares the aim of protecting the institution against the “economization, and subordination to the populist logic of the culture industry,” only to say: “That is why we believe that right now it would be wrong to refuse to work in any way with cultural and academic institutions despite the fact that the majority of these institutions throughout the world are engaged in the flagrant propaganda of commodity fetishism and servile knowledge. The political propaganda of all other forms of human vocation either provokes the system’s harsh rejection or the system co-opts it into its spectacle. At the same time, however, the system is not homogeneous – it is greedy, stupid, and dependent. Today, this leaves us room to use these institutions to advance and promote our knowledge. We can bring this knowledge to a wide audience without succumbing to its distortion.” Institutions inviting Chto Delat decide to play this game. This is the case this time as well. In Wroclaw, the game with the institution takes on another dimension – the game with the potential inherent in the relationship with the audience and with the surrounding reality. Thanks to Chto Delat the monumental windows of the Awangarda Gallery, overlooking a busy street, become stands. The gallery turns into the audience, and the street turns into a performance. There is a clear reversal of the viewer-institution relationship, ascribed to the building by the very architectural device of unveiling and glazing the top coat of the facade of the historic palace ruined during WWII – and, in this way, opening up its institutional interior to constant public view. The metaphor of game and the play of opposing forces present inside and beyond the institutional framework does not merely serve the purpose of turning the set relationship between an art gallery and the external world inside out, but rather of evoking a critical reflection on the observed reality, seen as a potential that can be offered to the viewer. CHTO DELAT (WHAT IS TO BE DONE)? The Russian group Chto Delat is a platform that unites representatives of various areas of artistic and intellectual life: artists, philosophers, writers, activists, and social scientists. The group is guided by the principles of collectivism and self-realization. As described by its members, the core of the group is formed by a team of coordinators who cooperate closely with grassroots workgroups that share the principles of internationalism, feminism, and equality. Their activity represents the entire platform and provides a common context for interpreting their projects. Permanent activists of the collective include: Olga Egorova aka Tsaplya (artist, Petersburg), Artemy Magun (philosopher, Petersburg), Nikolay Oleynikov (artist, Moscow), Natalia Pershina aka Gluklya (artist, Petersburg), Alexei Penzin (philosopher, Moscow), David Riff (art critic, Moscow), Alexander Skidan (poet, critic, Petersburg), Oxana Timofeeva (philosopher, Moscow), Dmitri Vilensky (artist, Petersburg), and Nina Gasteva (choreographer). Chto Delat actions integrate different fields of intellectual activity: visual arts, literature, journalism, film, theatre, philosophy, and political thought. Created with a variety of tools, their work is a collective action, which means that it has a common context and stems from a deep theoretical reflection. The group realises its principles issuing a newspaper, creating movies, theatre, plays, installations, prints, murals, performing actions. Chto Delat are preoccupied with the issue of cultural autonomy, considered from the point of view of the artists who can’t perform in the post-Soviet Russia and create outside the mainstream, but also who are active in Europe. The group expresses its concern about art, today often perceived as a commodity or an element supposed to provide entertainment to the audience, a part of a system in which museums and galleries are instruments of power having monopolised presentation of art, while they should be institutions that help art search for truth about the world. The essence of art is to create the viewer’s awareness, to develop forms of critical perception of reality, and to be a tool for independent functioning in the world. This is a public activity, so that no authorities or institutions should have a monopoly over its “distribution.” In their projects Chto Delat discuss how culture functions in the machinery of western and post-Soviet capitalism, showing the culture’s dependence on the money, state, and ideology. Thus the emancipation of art guarantees human emancipation as such, and the role of artists and intellectuals is to expose the current situation and try to define the optimal conditions for the development of free creativity. For them a way to achieve these goals is to return to the original ideas of ​​the Left and fulfil them in a fresh combination of actions from the sphere of art, radical thought and politics. Defying the Russian cultural establishment and politics in general, the group operates outside the mainstream of the art world at home, on its outskirts. At the same time, Chto Delat is a very active group, constantly present and performing in the countries of Western Europe, the USA, or Australia. However, the “activity” and “existence” of the group can and should also be seen in a non-material way. Theoretical work, publishing an online newspaper, online meetings and lectures are just as important as the institutional dimension of their activity. The group’s projects have been shown in numerous group and individual exhibitions, including Kiasma Museum of Contemporary Art in Helsinki (2004), Museum of the History of St. Petersburg (2004), Kunsthalle Fridericianum, Kassel (2005), Centre for Contemporary Art in Moscow (2006), the 3rd Prague Biennale (2007), 11th Istanbul Biennial (2009), the Institute of Contemporary Arts in London (2010), the Staatliche Kunsthalle Baden-Baden (2011), Smart Project Space, Amsterdam (2011), Gallery 21, St. Petersburg (2012). The collective’s works are exhibited in the Museum of Contemporary Art in Belgrade, National Museum Reina Sofia in Madrid, Van Abbemuseum in Eindhoven, KIASMA Museum of Contemporary Art in Helsinki, the Library of the Museum of Modern Art in New York. Chto Delat has participated in many conferences, seminars, open discussions, meetings, lectures, e.g., Documenta 12 in Kassel (2007), Working Title: Archives at the Lodz Museum of Art (2009), and Former West in Berlin (2010, 2012). Disobedience Archive (The Republic), 2005–ongoing. Installation view, Céline Condorelli, “The Parliament,” 2012. Photo courtesy Bildmuseet, Umeå, and Castello di Rivoli Museo d’Arte Contemporanea, Rivoli-Turin. After Van Abbemuseum (Eindhoven), Nottingham Contemporary, Raven Row (London), the Massachusetts Institute of Technology (Boston) and Bildmuseet (Umeå), Disobedience Archive is presented at Castello di Rivoli Museo d’Arte Contemporanea within a format especially planned for the Museum. The curatorial project dates from 2005, when Marco Scotini planned a travelling exhibition of videos, graphic materials and ephemera whilst in Berlin. The exhibition-archive explores the links between contemporary art practices, cinema, tactile media and political activism. Planned as a heterogeneous, evolving archive of video images, the project aims to be a ‘user’s guide’ to four decades of social disobedience seen through history and geography: from the revolt in Italy in 1977 to the global protests before and after Seattle and on to the current insurrections in the Middle East and Arab world. From the historic videotapes of Alberto Grifi to the films of Harun Farocki, from the performances of the American Critical Art Ensemble to those of the Russian collective Chto Delat, and from the investigations of Hito Steyerl to those of Eyal Sivan, the Disobedience archive has over the years gathered hundreds of documentary elements. The exhibition, which will be hosted in the rooms of the third floor in the Castello di Rivoli, aims to offer a wide-ranging synthesis of the earlier editions. With the new title of Disobedience Archive (The Republic), the exhibition will include the production of a large Parliament-shaped structure and the publication of “La Costituzione” (The Constitution) as a concluding phase to the entire project. The archive takes place in The Parliament by Céline Condorelli (b. 1974), with a contribution by Martino Gamper (b. 1971), while the wall paintings accompanying it are by Mexican artist Erick Beltran (b. 1972). Aside from The Parliament, two rooms serve as thematic antechambers: the first, dedicated to the 1970s in Italy, amongst others, presents works by Joseph Beuys, Mario Merz, Gianfranco Baruchello, Laboratorio di Comunicazione Militante, Enzo Mari, Nanni Balestrini and Living Theatre beside documents by Carla Accardi, Carla Lonzi and Felix Guattari; the second, which considers the first decade of the 21st century, houses works by Nomeda & Gediminas Urbonas, Superflex, Chto Delat, Journal of Aesthetics & Protest, Oliver Ressler, Arseniy Zhilyaev, Critical Art Ensemble, Rene Gabri and Ayreen Anastas, among others. Technical instruments, props and published materials produced by the antagonist culture of those years are also displayed in these two rooms. Disobedience Archive (The Republic) is a work in progress reflecting on the various events as they unfolded, in which form and content vary with each venue. In this sense, the exhibition constitutes a sort of atlas of the different contemporary antagonist tactics: from direct action to counter-information, from constituent practices to forms of bio-resistance, which emerged after the end of modernism, inaugurating new methods of being, saying and doing. The archive is divided into nine sections: “1977 The Italian Exit,” “Protesting Capitalist Globalization,” “Reclaim the Streets,” “Bioresistence and Society of Control,” “Argentina Fabrica Social,” “Disobedience East,” “Disobedience University,” “The Arab Dissent” and “Gender Politics,” which joins the other sections for the Castello di Rivoli exhibition. The archive includes materials by 16 beaver, Atelier d’Architecture Autogérée (AAA), Mitra Azar, Gianfranco Baruchello, Petra Bauer, Pauline Boudry, Brigitta Kuster and Renate Korenz, Bernadette Corporation, Black Audio Film Collective, Ursula Biemann, Collettivo femminista di cinema, Copenhagen Free University, Critical Art Ensemble, Dodo Brothers, Marcelo Expósito, Harun Farocki and Andrei Ujica, Rene Gabri and Ayreen Anastas, Grupo de Arte Callejero, Etcétera, Alberto Grifi, Ashley Hunt, Kanal B, Khaled Jarrar, John Jordan and Isabelle Fremeaux, Laboratorio di Comunicazione Militante, Silvia Maglioni and Graeme Thomson, Angela Melitopoulos, Mosireen, Carlos Motta, Non Governamental Control Commission, Wael Noureddine, Margit Czencki/Park Fiction, R.E.P. Group, Oliver Ressler and Zanny Begg, Joanne Richardson, Roy Samaha, Eyal Sivan, Hito Steyerl, The Department of Space and Land Reclamation, Mariette Schiltz and Bert Theis, Ultra-red, Nomeda & Gediminas Urbonas, Trampolin House (Morten Goll and Tone O. Nielsen), Dmitry Vilensky and Chto Delat, James Wentzy. The exhibition has been realised thanks to the collaboration of Open Care Servizi per l’Arte, Milan and NABA Nuova Accademia di Belle Arti, Milan together with the Biennio di Arti Visive e Studi Curatoriali. Where Has Communism Gone?, a Learning Play initiated by Chto Delat as part of FORMER WEST: Documents, Constellations, Prospects (Haus der Kulturen der Welt, Berlin). The process takes place between March 16 and March 23, 2013. You are invited to participate in a four-day seminar led by the artist collective Chto Delat, and develop and perform the collective learning play Where Has Communism Gone? 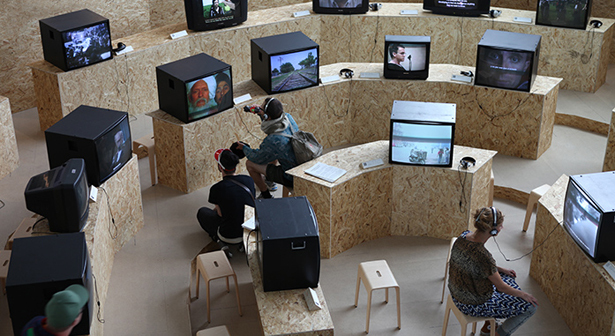 as part of the main program of FORMER WEST: Documents, Constellations, Prospects, at Haus der Kulturen der Welt, Berlin from 18–24 March 2013. Using playwright and director Bertolt Brecht’s model of the learning play, Chto Delat invite 25 participants to collectively develop an educational didactic performance. Centered on the question “where has communism gone?” participants are asked to work on and articulate their own positions throughout the process of acquiring and advocating for their attitudes towards this theme. The seminar consists of four subsequent sessions of collective discussions-rehearsals, which culminate in the staging of a Brechtian learning play on Thursday, March 21, at 21:24. Involvement is limited to 25 participants. Participants must commit to full attendance for all five days’ activities, including seminar, rehearsal, and the staging of the learning play. Each participant receives an honorarium of 150 euros and a week-long pass for FORMER WEST: Documents, Constellations, Prospects. In order to participate, please send a motivational statement to Dmitry Vilensky dmvilen@gmail.com and Annika Kuhlmann annika.kuhlmann@hkw.de. Annika can respond to all organizational questions, and can also be reached by phone at +49 30 39787 224. Where has communism gone? This question refers, firstly, to Russian revolutionary writer Andrei Platonov. The hero of his novel Chevengur suddenly awakes in the middle of the night after a dream asking where socialism is, searching for it as if it were an object, a thing which supposedly belongs to him. Following the line of thought in this passage, socialism or communism is communicated as an object of desire, and this kind of desire, as Marxist political theorist Fredric Jameson says, has not yet found its Sigmund Freud or Jacques Lacan. By posing the question about communism, we aim to explore the nature of this political desire, which, in spite of the demise of what is called “real socialism” or “communist regimes,” is still persistent, at least in the field of contemporary theory and art. We are used to the reality principle of one-dimensional liberal propaganda, according to which nothing can be better than the present state of things, which in fact means the neoliberal economy accompanied by the rhetoric of human rights and legal democracy. They say that communism was a utopian project that ended in disaster, with violence and totalitarianism, and the only thing we have left to do is to forget all hope for a better future for society and focus on our individual lives, to enjoy this eternal present, to use our possibilities and skills to succeed in working our way up a pyramid built of money, trampling the heads of others as we climb. However, today, after decades of excessive ideological overproduction of the monstrosity of communism, a general anti-communist phobia has ended in a new disappointment. The liberal utopia, based on the notion of free individuals freely operating in a free market, was demolished by a global economic, political, and ecological crisis. From this perspective, all the debates about communism became valuable and actual again, not only with communism as a valuable experience from the past, but also as an alternative for the future. The only problem is nobody really takes it seriously. Neoliberal institutions easily give their money to any kind of creative and sophisticated critic of the present, taking for granted that all these debates are based on market exchange, and that all the ideas discussed have their own nominal values. The ghost of communism still wanders around, and to transform it into a commodity form seems a good way to finally get rid of it. Conferences and artistic events dedicated to the idea of communism go on one after another, speakers are paid or not paid, advertisement production machines function well, and the globe turns round as before. But beyond this exhausting machinery of actualization and commodification, we still have as a potentiality this totally new desire of communism, the desire which cannot help but be shared, since it keeps in itself the “commons” of communism, the claim for togetherness, so ambiguous and problematic within the human species. This claim cannot be privatized, calculated, and capitalized since it exists not inside individuals, but between them, between us, and can be experienced in our attempts to construct this space between, to expose ourselves inside this “commons” and teach ourselves to produce it out of what we have as social beings. We invite you to think, discuss, and live through these issues together at our seminar and try to find a form of representation for our debate. During this seminar the platform is represented by Olga Egorova (Tsaplya), Nina Gasteva, Artemy Magun, Alexei Penzin, Natalya Pershina, David Riff, Oxana Timofeeva, Alexander Skidan, and Dmitry Vilensky. FORMER WEST: Documents, Constellations, Prospects consists of artworks, talks, discussions, rehearsals, and performances in various constellations of documents and prospects that offer a multitude of encounters with the public for negotiating the way of the world from 1989 to today, and thinking beyond. The seven-day period is guided by five currents that feature contemporary negotiations on Art Production, Infrastructure, and Insurgent Cosmopolitanism, with Dissident Knowledges contributions offering dynamic interventions into the ongoing program with artworks, performances, and statements. Finally, Learning Place operates alongside the full program involving students in workshops and inviting them to engage in the week of discussions. Conceptualized by Maria Hlavajova and Kathrin Rhomberg in collaboration with Boris Buden, Boris Groys, Ranjit Hoskote, Katrin Klingan, and Irit Rogoff. FORMER WEST: Documents, Constellations, Prospects is a joint project by Haus der Kulturen der Welt, Berlin and BAK, basis voor actuele kunst, Utrecht. For the full program, complete list of contributors, and live streaming, as well as full project archive, please visit the FORMER WEST Digital Platform at www.formerwest.org. FORMER WEST (2008–2014) is a long-term research, education, exhibition, and publication project initiated by BAK, basis voor actuele kunst, Utrecht and aimed at a critical reinterpretation of post-1989, post-Cold War histories around an artistic imaginary of “formerness,” countering the persistent hegemonies of the so-called West within a global context. Behind the phrase that lends this exhibition its title there are two thinkers: Jean Baudrillard and Andreas Huyssen. The former defined simulation as the creation of something that “has no relationship to any reality whatsoever,” and therefore predicted the replacement of “the real” by “the virtual.” Huyssen picks up where Baudrillard left off, positing that, since reality has been lost and replaced by its simulacrum, utopia cannot exist. Hence the title, “if there is no reality, there can be no utopia.” In other words, in the age of simulacra and virtual reality, the disappearance of the real also entails the end of the utopian. In the age of information, actual reality has been supplanted by virtual reality, computer simulation and false narratives. Since the concept of utopia is based on the improvement of reality, the disappearance of the real also signals the end of utopia. Without Reality There Is No Utopia illustrates this premise by examining false narratives that masquerade as truth; the collapse of Communism in the 1980s; the recent financial crisis, which heralds the demise of capitalism; the contradictions inherent in geopolitics; and the explosion of democratic uprisings that rebounded around the world. The exhibition, organized into two asymmetrical sections, includes work by twenty-two international artists in photography, video, drawing, painting, collage and more. The first is The Description of the Lie, a skeptical introduction to the systems, which fabricate the simulacra of the real. In this section, the artists focus on how truth has been replaced by media-constructed false narratives. Judi Werthein‘s work portrays life in a settlement in a region of Chile peopled entirely by Germans exiled from their country after World War II; and Dora García fictionalizes the paranoid state of surveillance generated by the Stasi in the former East Germany. Other artists in this section are Rirkrit Tiravanija and Lene Berg. The second section bears the title Collapses and is divided into four sub-sections: communism, capitalism, geopolitics and democracy. As Huyssen aptly put it, “Utopia never dies alone. It takes its counter-utopia down with it.” Therefore, when communism falls it takes capitalism down, and as capitalism collapses it drags democracy along with it, since the latter decided to cast its lot in with the former. At the same time, the expansive system that characterizes capitalism also implies its geopolitical implosion. It therefore seems that we should seriously consider the demise of utopia as the great problem of our time. Artists in The Collapse of Communism examine the conditions leading up to, and the aftermath of, the fall of Communism. The Russian collective Chto Delat (What is To Be Done?) encourages the viewer to critically engage with the events that lead to the demise of the Soviet system; paintings by Manolo Quejido were inspired by a trip to Cuba, where he asks, “What can we do right now with our desire for revolution?” and Ciprian Mureşan considers the paradoxes of history and memory from a post-Communist perspective. The Collapse of Capitalism focuses on the effects of the 2008 world financial crisis, with the premise that this was the inevitable result of a system based on consumerism, waste and the depletion of the planet’s resources. SUPERFLEX Collective‘s humorous parody The Financial Crisis ironically suggests that the crisis is an illness that can be cured through hypnosis; and El Roto‘s cartoons, which mix irony, dark humor and sarcasm, create a stark portrait of the current situation in Spain. Other artists in this section are Daniel García Andujar, Jan Peter Hammer and Katya Sander. The artists in The Geopolitical section examine the influences of colonialism and the West on recent geopolitical uprisings. Through a collection of posters, Zeina Maasri documents the civil war in Lebanon between 1975 and 1990; and in his drawings Fernando Bryce depicts colonial practices and their “civilizing” discourses. Other artists in this section are Ignasi Aballí, Zhou Xiaohu and Federico Guzmán. The Democracy section traces the effects of technology on communications, privacy and public assembly and their impact on democracy. Ed Hall‘s banners depict the micro-history of recent social struggles in England; Artur Żmijewski‘s videos of intentional public gatherings in various cities—Belfast, Berlin, Strasbourg, the West Bank, and Warsaw—feature playful and celebratory events; Oliver Ressler interviews philosophers, politicians, activists and concerned citizens, asking What is Democracy? ; and Carlos Motta‘s photographs feature political graffiti on the walls of various Latin American cities. Without Reality There Is No Utopia is organized by the Centro Andaluz de Arte Conteporaneo in Seville, Spain, where it was originally presented in 2011. Curators are Alicia Murría, Mariano Navarro and Juan Antonio Álvarez Reyes. For more information on Without Reality There Is No Utopia, artist bios, and visitor information, click here.